The W3 Wireless Audio Adapter is a wireless adapter for all your devices and apps. 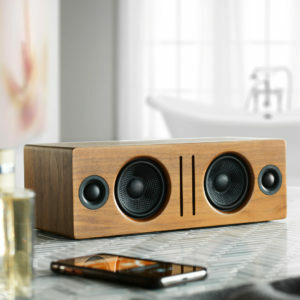 Play all your music wirelessly from any audio device or computer to your Audioengine powered speakers, stereo receiver, or powered subwoofer. W3 provides CD-quality stereo sound with no reduction in audio quality and can connect up to three devices. Setup is easy, making W3 a true plug-and-play wireless audio solution. Simply connect W3 Sender to any audio source – your computer, TV, etc – and connect the W3 Receiver to any input on your stereo, powered speakers, or subwoofer and in seconds you have wired-quality sound without the wires. W3 requires no software downloads, network setup, has a 100-foot range, and provides CD-quality sound without dropouts or interference. Hear all your music without any dropouts, static, or noise. And some very clever engineering means your music remains free from interference from wifi routers, phones, and other wireless devices. The Audioengine W3 Wireless Audio Adapter sets a new level of quality and ease-of-use for wireless audio. Even if you’re not an audio enthusiast, we guarantee you will still hear a difference!